Most artists prefer to work in seclusion and silence. Some of my favorite moments are when folks come into the gallery and realize that in one very clean corner of my gallery is my studio. Their eyes light up when I offer for them to gently place a hand on mine while I’m raising the clay on a large piece at my wheel. I’m perfectly happy to have people watch me work. Sculpting with clients in my gallery is pure joy. We are often told throughout our lives that we are not good at creating, not good at art. This is ridiculous. Everyone is creative! They’ve just not been given a kind, non-judgmental environment in which to succeed. My clients offer innovative ideas for creative commissions. My collectors are invited to watch as I create their works of art before their eyes. 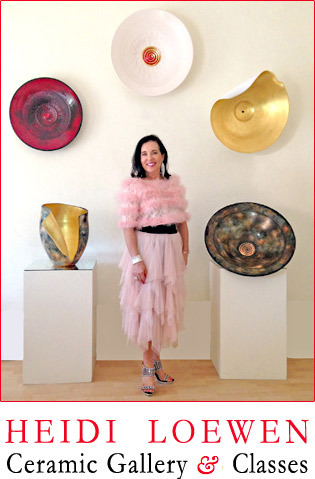 More and more of my collectors get inspired to work along side me, creating their own sculptures and vessels. What does that mean? Any individual, or couple may request for me to make a certain size or shaped vessel. When the clay arrives at its perfect malleable state, the collectors are invited to come fold, furl, curl, slice or karate chop their vessel or sculpture. Naturally, at first they may be shy to work on the clay. With a few assurances and hands on mine to commence, they get the hang of creating perfectly and continue all on their own. It’s great fun for them to be such a vital part of the process. We even photograph or videotape them at work! This makes for a grand memory.